Debugging Arduino programs can be difficult, as the only easy output method is a serial console. With lots of debug messages the console soon becomes full and difficult to read efficiently. The biggest issue is the console scrolls, so with lots of output the text scrolls past too fast to read. One solution is to write a simple app on your laptop/desktop that listens to the serial data and displays it in an app with a better layout. You can create individual text boxes that just display the values of key variables, and the app can scan the serial stream looking for these variables and update the text box every time it sees a new value. Depending on your microcontroller code purpose, you can also chose more appropriate visual representations of your debug variables. For example, you could show an arrow on a compass to represent the value you get from a magnetometer, you can plot a point on a Google map page in and HTML control to show the position you get from a GPS, and you can display green and red dots to show the value of switches, etc. I use Visual Basic, just because I find it easy. You can design the visual layout of the app easily, and the code is very simple, but *any* programming language will work. Pick one you are most familiar with. You don’t want to waste time building the debugging console, when you could spend that time debugging your microcontroller code. I use two techniques in the serial protocol; I prefix each line with a symbol that defines what type of data the line contains and I use name / value pairs for data to display. # – denotes debug messages. I add a time stamp to them and display them in a “messages” text box. $ – denotes a name / value pair. The value is displayed in a text box for that name. Instead of a difficult to read scrolling text window, I now have a stable windows app that displays each variable I want to track in an easy to read layout. In addition, I have a log of messages, with time stamps, I can scroll back through looking for interesting events. Finally, you can also decide to output some values are different frequencies, i.e. the fast changing values every 500ms, and the slow changing values every 5 seconds. The app also shows the current value for everything. You can also get your microcontroller to listen to the input serial stream and use the app to send commands to your device. Add an XBee and now your microcontroller is wirelessly remotely monitored and controlled by your app on your desktop ! 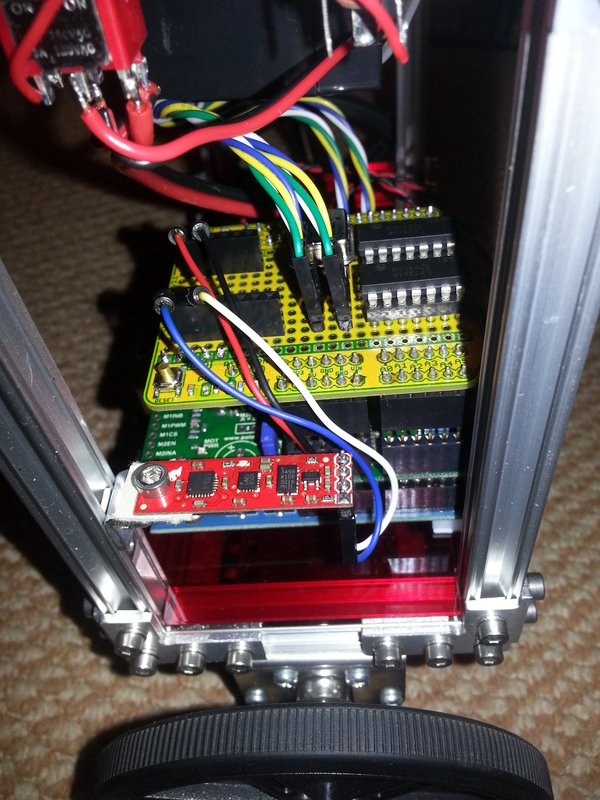 This entry was posted in BalanceBot and tagged Arduino, BalanceBot, Robots on June 23, 2013 by mostlyrobots2012. The frame of the robot is built from MicroRax but it has no “sides”. I needed to mount some switches, etc. plus I wanted to mount the Arduino board securely and the two mounting holes in the Arduino are at very specific locations which would be better secured to a flat surface. They didn’t line up with the MicroRax. The initial prototype had a hardboard base, but I thought I’d use the opportunity to learn how to get laser cut plastic. I found a supplier, Ponoko, which had a very simple interface. A lot of laser cutting houses use AutoCAD or Illustrator file formats to define the shape to cut. As I didn’t have an applications that can produce these, I liked Ponoko, as it used PNG. This can be generated huge number of apps, a lot of which are free. Ponoko provide a sample template. The format is very straight forward. 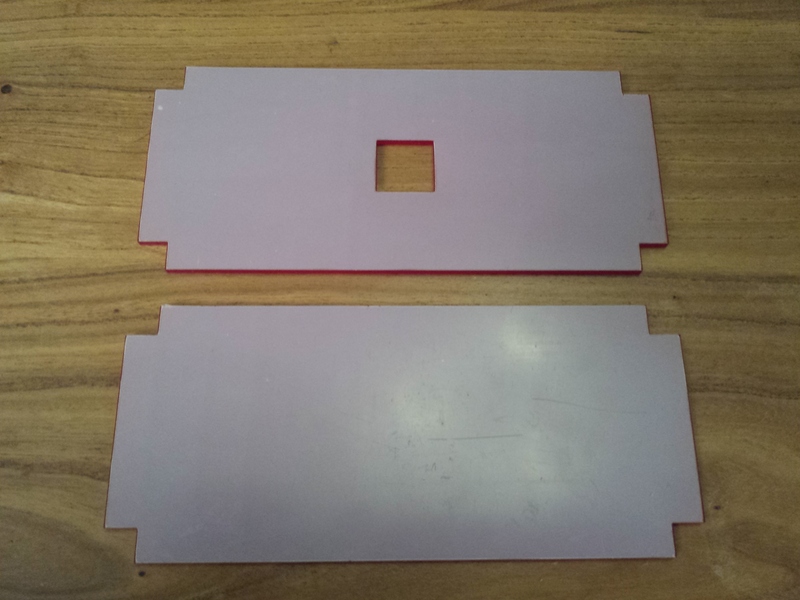 The colour of the line in the file defines the cut the laser will make. E.g. Cut, engrave, etc. They also have a huge array of materials, including acrylic, leather, card, wood, paper, rubber, etc. I designed a top and a bottom. The bottom has a hole for the cables. The top is engraved (no reason other than I wanted to try it and it looks cool :-)) I didn’t get the holes for the switches laser cut, I drilled them, as I didn’t know at the time what switches I would be using. PNG file used to laser cut the acrylic. Different coloured lines represent different types of cut or engraving. Laser Cut Acryilic sheets. Cut by Ponoko. The panels made mounting the boards and switches trivial. I used self-adhesive PCB supports for the Arduino. The holes on the Arduino are 3.2mm. I found PCB supports 6.4mm high from RS which fitted perfectly. 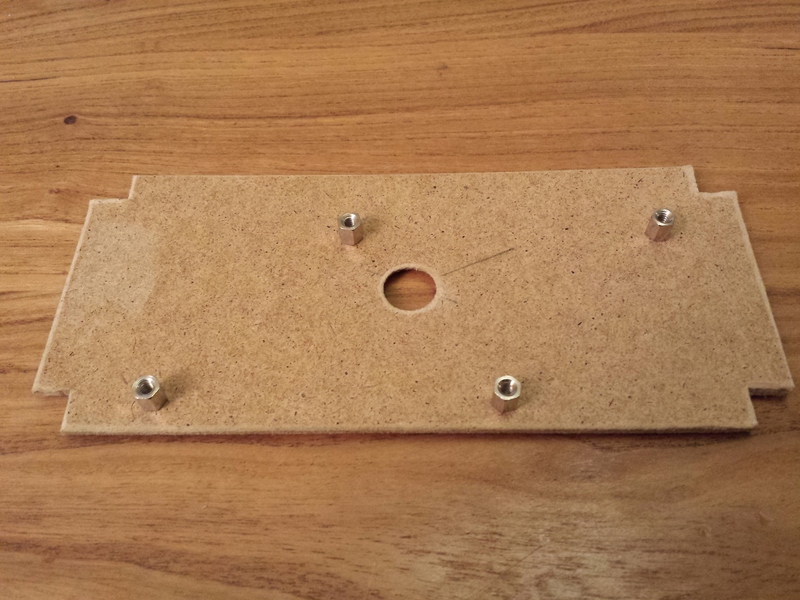 The Acryilic is easy to drip, so I hand drilled holes for the switches and buttons. This entry was posted in BalanceBot and tagged Acrylic, Arduino, BalanceBot, Laser Cut, Robots on June 23, 2013 by mostlyrobots2012. With the use of the various libraries the main code loop is very simple. Once all the objects are initialised, the loop reads the robots angle, computes the PID output and uses that to set the motor speed and direction. The system worked (ish). As mentioned previously, it took a while to find the PID parameters, and they are still not perfect. However I did get a problem. The robot would balance, but after a few minutes, both motors would just turn on full. Sometimes one motor. The strange thing was sometimes the other motor would still be managed by the PID algorithm, and would change direction when the robot was tilted back and forth, so it wasn’t as if the Arduino had crashed. I initially thought there was a short circuit or lose connection but I couldn’t find one. I had trouble in the past with other projects, where the code is large and complex, the Arduino sometimes exhibits strange behaviour. Not quite crashing, but being erroneous. I has a suspicion the device is running out of RAM. The programs either had too many variables, or too many recursive functions. I’ve not researched a way to model programs to estimate their RAM usage, or if there is a way to report RAM usage via the code. I’m sure there’s a way. Let me know if you have any ideas. So, I just threw hardware at the issue, and upgraded the Arduino with a Mega, which has four times the RAM (8k on the Mega verses 2k on the Uno). This solved the problem immediately. Whereas the robot would “crash” every time on the Uno, the same code worked without any issue on the Mega. The other issue was the SPI and TWI pins on the Mega are on different pins to the Uno. Not a huge problem, but until I update the shield PCB, it means jumper wires. // IMU uses I2C - pins 20 (SDA) & 21 (SCL). This entry was posted in BalanceBot and tagged Arduino, BalanceBot, IMU, PID, Robots on March 11, 2013 by mostlyrobots2012. A PID Controller is a software algorithm typically used to control industrial processes. A PID Controller (Proportional Integral Derivative Controller) calculates the difference between a measured variable and a desired set point. The controller attempts to minimize the error by adjusting the input. A good example of why a PID Controller is better than other methods of control, is an electric oven. The input is the power to the heating element, the output is the temperature and the set point is the desired temperature. Without a PID controller, If you turn the power on and off using a simple thermostat, when the temperature of the oven reaches the set point the oven will over shoot the temperature as there is residual heat left in the heating element. If you want the temperature of the oven to be 200 degrees, and have the element fully on until it reaches 200 degrees, then turn it fully off, the temperature will overshoot to maybe 205 degrees, then slowly cool until it reached 199 degrees when it will turn fully on again, however it will take time to heat up, in which time the oven has cooled to 195 degrees, and so it repeats. The oven will oscillate between 195 and 205 degrees, and not actually be a steady 200. This is fine for cooking sausages, but no good for a delicate chemical process. The PID Controller has three values; the Proportional, the Integral and the Derivative values, denoted P, I, and D. Heuristically, these values can be interpreted in terms of time: P depends on the present error, I depends on the accumulation of past errors, and D is a prediction of future errors, based on current rate of change. By combining the three terms continuously the algorithm maintains the desired set point with minimal errors. The only problem is you need to “tune” a PID Controller to your specific application. The P, I & D terms will be different for an oven, chemical tank, or balancing robot. There are lots of ways of tuning a PID Controller, from mathematical, to trial and error. A control systems friend of mine recommended I try the Ziegler–Nichols method. The P, I & D terms are referred to as “gains” Kp, Ki & Kd. The Ki and Kd terms are first set to zero. The Kp term is manually increased until the robot reaches the ultimate gain, Ku, at which point the it starts to oscillate. This isn’t perfectly tuned to our specific system, but it’s a good approximation. PID tuning is a black art that requires a lot of knowledge and skill. This will do for the time being. I am using the tilt angle of the robot as the input and the speed of the motors as the output. The code is quite simple. The three variables are all floating point numbers. Then in my main loop I get the angle of the robot, run the PID compute function, and using the output set the motor speeds. That’s the theory anyway … the results were mixed. It took a number of attempts to find the oscillation gain and period (Ku & Pu) accurately. And with those values, the PID controller wouldn’t balance the robot. It took lots of manually trial and error of various values to find something that was stable. PID tuning is very much a black art. I did get it to balance though and it was more stable that the equivalent “cubed” algorithm I was using. However with the IMU code and the PID code on the Arduino, I started getting problems with the Arduino crashing. I can only assume it was running out of RAM. I switched to an Arduino Mega and everything worked fine. So I’ve stuck with that for the time being. The Mega is much more stable, however the custom PCBs I made don’t fit the Mega, so the wiring is messy, plus the Mega sticks out of the frame. Next job is to make the PCB as a Mega Shield and turn the board round long ways so it fits better. The PID controller is still not perfect, but it’s relatively stable. You can see it recovers from oscillation, which the basic controller didn’t. But It still drifts badly, and still falls over eventually. But progress none the less.I need to get the Quadrature decoders working so I can stop the drifting. 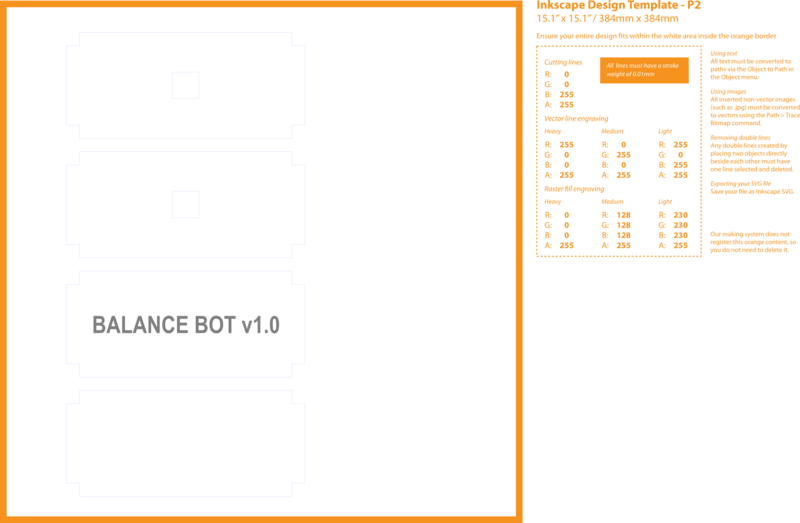 Here’s a short video of the PID Controlled BalanaceBot in action. This entry was posted in BalanceBot and tagged Arduino, BalanceBot, IMU, PID, Robots on February 7, 2013 by mostlyrobots2012. 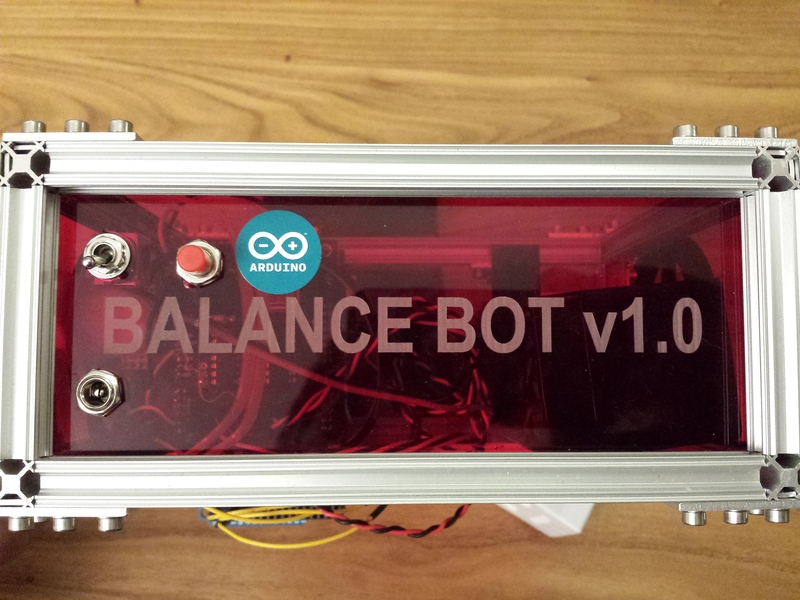 The very first time my BalanceBot balanced. It drifts quite a lot, but not bad for a first attempt. It just has a simple “squared” function for control. Speed = Angle ^ 2. No PID yet. The BalanceBot needs to know if it’s upright to balance. If it starts tipping over in one direction the robot needs to sense how far it has tipped over and speed up the motors in that direction to counter the tipping motion. This will compensate for the tipping motion by driving the bottom of the robot under its centre of gravity and stand it back upright again. Sensing the angle of the robot on a simple level could be achieved with a single g-force sensor or accelerometer. The accelerometer measures acceleration. Our planets gravity, acting on an object, is acceleration, so the accelerometer can be used to measure gravity. Gravity always pulls down towards ground at a constant value. By knowing the value you can calculate the angle of the sensor. If the sensor reads 1g, the sensor is “vertical” with the ground. If the accelerometer reads 0g the sensor is “horizontal” with the ground. By using trigonometry, the value of g can be used to calculate any angle of the sensor. However this is only true if the sensor is perfectly still, and the only acceleration acting on it is gravity. As we are going to mount this in a moving robot, the acceleration of the robot will cause the accelerometer to read not just the gravitational force, but also any acceleration of the robot, which will render the reading inaccurate when calculating the angle of the robot. Another method of measuring the angle of the robot is with a gyroscope. A gyroscope measures rotation velocity around an axis. If you know the angle of the sensor to start with, then continuously measure the rate at which it rotates, you can calculate the current angle. This has two issues; firstly you need to know your angle to start with and secondly any error in the calculation is compounded with time, so the calculated value “drifts” over time and become less accurate. However a gyroscope is immune to interface from acceleration. So, if you can combine the accelerometer data and gyroscope data together you can use both readings to compensate for the inaccuracies of the other. The accelerometers can compensate for the gyroscope drift as they give exact readings at a known time. The gyroscopes compensate for the non-gravitational acceleration as they only measure rotation velocity. This process is called “sensor fusion”. There are lots of method of processing the accelerometer and gyroscope data to give a single accurate angular reading. These include Kalman Filters and Complimentary Filters. The maths can get a bit complex but it’s all based on trigonometry. You could write your own code, but there are lots of existing, tested, libraries that do this for you. Using such a library and the appropriate sensor can give your orientation in 3D space, your Roll, Pitch and Yaw angles, or Euler Angles. This traditionally uses an additional sensor to measure yaw, as yaw cannot be measured with a g sensor, as yaw rotates around the vertical axis, and so the force of gravity doesn’t change. The easiest way to measure yaw is with a magnetometer, this measures the earth magnetic field and can calculate your orientation to “North” (magnetic north). BalanceBot IMU – Sparkfun 9 DOF sensor stick. The individual sensors all work in a single plane, so a single gyroscope only measures rotational velocity in one direction. An accelerometer only measures acceleration in one direction. Depending on how much your sensor, or robot, moves, you may need three of each sensor in each orientation (x, y & z) to calculate your orientation in 3D space. For example, as the “X” axis accelerometer rotates it will no longer be vertical and will become horizontal at which point, depending on the orientation, of the sensor either the “Y” or “Z” accelerometer begin to point down. Using 3D trigonometry of the X, Y & Z accelerometer reading, you can begin to calculate the orientation in 360 degrees. This is called “three degrees of freedom” you are measuring 3 independent parameters that define its orientation. If you add three gyroscopes, and three magnetometers, you end up with 9 Degrees of Freedom, or 9DOF. Using a 9DOF sensor and a maths library, you can calculate (almost) any orientation accurately. This combination of sensors and maths is called an Inertial Measurement Unit or IMU. There are lots of these, ranging in accuracy and cost. They can cost thousands of pounds. However there are lots of hobby level devices too for less than £100. You have the choice of separate sensors and use your own CPU for the maths, or use an all in one device that includes its own CPU. I have an UM6-LT Orientation Sensor from CH Robotics for a different project. They are easy to interface to and do all the Kalman filtering for you on board and provide the filtered, stable Euler Angles via a serial interface. However I was using this device in a different project. There are many 9 DoF boards containing just the sensors. FreeIMU is a popular board, cheap and compact. SparkFun produce a 9DoF Sensor Stick which I decided on, as its cheap, small and easy to interface to. The FreeIMU site provides a GNU GPL license library for Arduino which supports not only the FreeIMU boards but also the SparkFun boards and the DIYDrones ArduIMU. This provided the sensor fusion calculations to provide a stable combined output from the raw sensors. The SparkFun board uses an I2C interface to communicate with the Arduino. This is a bidirectional serial interface, using just two data wires, and power. To be clear I didn’t need a 9DOF board in this simple robot, as I only needed to calculate the robots orientation in one axis (the axis that rotates around the wheels) however, by using a 9DOF board I get full 3D orientation which means it doesn’t matter which direction I mount the sensor in, plus I intend to use the magnetometer reading to capture the “heading” the robot is traveling on so I can make it travel in a straight line. It was also fun to learn. There are two common ways to represent a 3D orientation; Euler Angles and Quaternions. Euler Angles can be understood easily if you imagine an old fashioned gyroscope in an aeroplane. A spinning mass is suspended in space on 3 gimbal bearings, that each rotate in a perpendicular axis. As the aeroplane tilts left and right (rolls) the gimbals rotate to keep the mass level. This angle of roll is the Roll Euler Angle. Same for Pitch, the movement of the nose of the plane up and down, and Yaw the rotation of the plane caused by the movement of the rudder. These three Euler angles define the Roll, Pitch and Yaw of the object. However Euler Angles have a flaw, as one of the axis rotates 90 degrees, it aligns with one of the other axis. In fact all three axis can align. This is called Gimbal Lock. Gimbal lock is the loss of one degree of freedom in a three-dimensional space that occurs when the axes of two of the three gimbals are driven into a parallel configuration, “locking” the system into rotation in a degenerate two-dimensional space. So, I stuck with Euler Angles. This fills a 3 dimensional variable with three floating point numbers, which contains the Pitch, Roll and Yaw angles. If the angle is 1 degree, the speed is 1 (slow), if the angle is 2 degrees the speed is 8 (faster), if the angle is 3 degrees the speed is 27 (quite quick), etc. The more the robot falls over the faster the wheels rotate to stand it back up. When the robot is upright the speed is very slow so the robot doesn’t overshoot and start to oscillate. Of course it does oscillate with this very simplistic control algorithm and falls over. We need a more complicated control algorithm to stop the oscillation. This entry was posted in BalanceBot and tagged Arduino, BalanceBot, IMU, Kalman Filters, PID, Quaternions, Robots on February 6, 2013 by mostlyrobots2012.